By now, most of you have likely heard that former Vice President Joe Biden is close to announcing his plans to run for the presidency for the third time. Beyond that, he’s reportedly requested a meeting with failed Georgia gubernatorial candidate Stacey Abrams, with a mind toward locking her in as his running mate from day one. I’ve already chimed in on why naming a running mate more than a year in advance is a bad idea in general, but specifically picking Abrams might compound the problem even further. 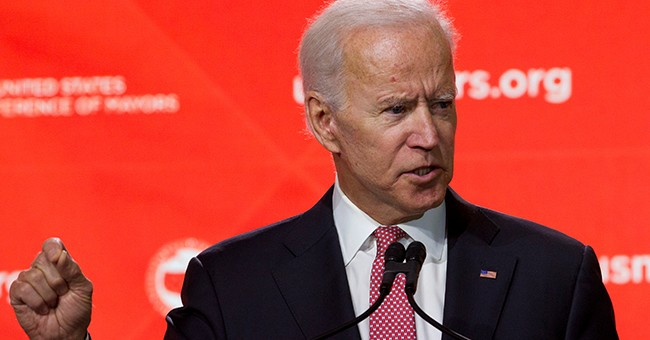 Tiana Lowe, writing at the Washington Examiner, expands on the reasons that an Abrams pick could be problematic and potentially sink Biden’s candidacy. If any single candidate in the 2020 presidential race can galvanize the Obama base and swing the disaffected center and Never Trump coalition of the Republican Party, it’s former Vice President Joe Biden. For all his gaffes and faux pas, Uncle Joe is uniquely positioned to burst back into the scene and on the center of the debate stage. Yet Biden may be throwing a wrench into not just this strategy but his candidacy as a whole if the rumors that he’s actively courting Stacey Abrams to announce not just his presidential bid, but the failed gubernatorial candidate from Georgia as his running mate at the same time. Axios reports that despite opposition from his advisers, Biden specifically requested a meeting with Abrams to seriously consider bringing her onto the ticket from the start. To recap, Abrams’ resume includes a few years as a tax attorney, another as deputy city attorney for Atlanta, a decade in the Georgia General Assembly, and an anonymous career as a romance writer. That’s it. That’s her entire career. There are more questions about Abrams to be answered than just her rather thin resume, though that will certainly be a factor. In order to be successful in the general election, Joe Biden is going to have to win back the significant portions of the voting public that Barack Obama carried and Hillary Clinton managed to lose. Obama energized minority voters in a way that hadn’t been seen in a very long time, while still lighting up the excitement of both far-left progressives and more skeptical moderates. From that perspective, Biden clearly needs to harness some of that old Obama magic, and perhaps he sees Abrams as the ticket to accomplishing that. To be sure, Barack Obama and Stacey Abrams have more in common than just race, but it’s probably not the set of qualities that made the 44th President successful at the ballot box. Abrams has very nearly the same lack of resume items that Obama did in 2008. Obama had a short stint as a state senator, while Abrams similarly served for a while in the Georgia state assembly. They were both attorneys, and Obama rounded out his experience by working as a “community organizer” while Abrams filled her hours penning bodice-rippers. In that regard, there’s little substantive difference between the empty suit of Barack Obama and the empty pantsuit of Stacy Abrams. But Obama had something going for him that may be lacking in Biden’s potential running mate. From all of the speeches I’ve seen thus far, Stacey Abrams very much lacks Barack Obama’s fiery, revival tent preacher style of speaking. She ran an admirable campaign in an unsettled Georgia electorate to be sure, but can you recall one of her speeches or defining events off the top of your head? Where was her “Yes We Can” moment? Assuming that minority voters will once again turn out in droves for Stacey Abrams just because she’s Black is seriously insulting to minority voters. You have to deliver something more than that. Barack Obama cracked that puzzle twice in a row. I seriously doubt Joe Biden can outsource the job to Stacey Abrams and get away with it.